This week marks the halfway point of President Trump’s first 100 days in office. During that time, he’s taken aim at environmental policies on air pollution, water pollution and climate change, inspiring many Californians to protest. On the other hand, some Trump supporters in rural parts of the state are cheering even louder now than they were during the election. About two hours north of San Francisco I talked to many residents around the town of Red Bluff who are big fans of Trump. Although Hillary Clinton won California in a landslide, some four million people voted for Trump, and he won Tehama County by a landslide. 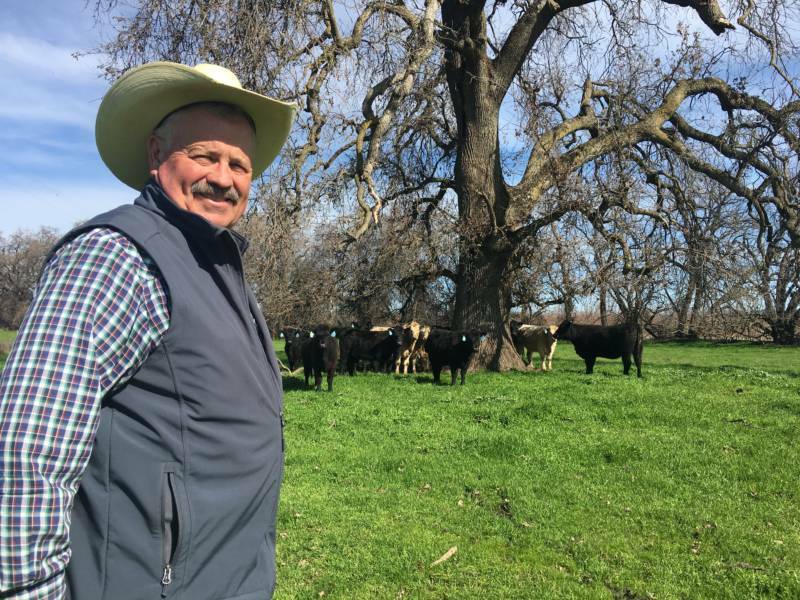 “He’s our only hope,” says rancher Wally Roney, who has felt that the Democrats have been increasing regulations at an onerous pace. 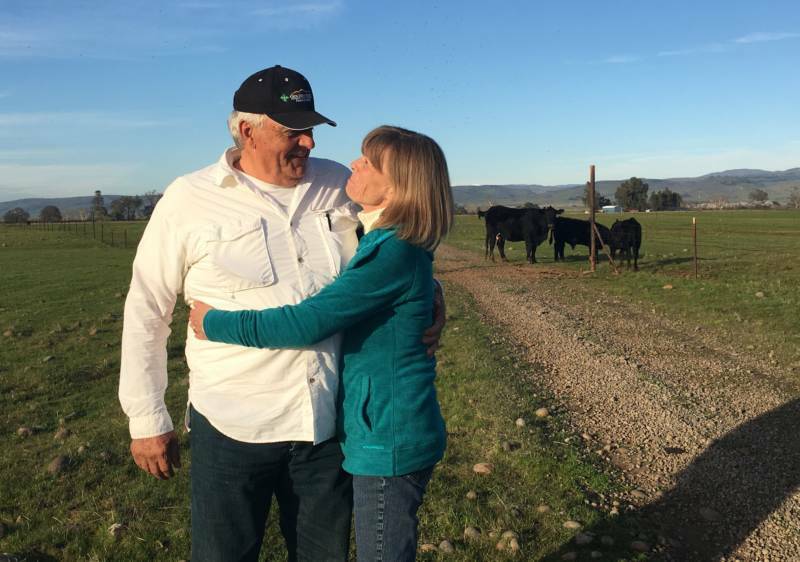 Roney grazes cattle on 100,000 acres of private and federal land. He’s the sixth generation of his family to run cattle on rolling grasslands near the tiny town of Vina. You can see the snowy peaks of Mount Lassen and Mount Shasta from his front porch. His tidy home with modern decor is at the end of a gravel road. On a late afternoon a few hours before sunset, Roney takes me out on a tour of his property. We hop in his huge silver pickup. We bump along a potholed road beneath giant oak trees. Every few minutes we have to pause so he can swing open rusted cattle gates dripping from a recent rain storm. He pulls over at a creek where his black Angus steers often lap up water. Roney cheered last month when Trump shelved a law that would have expanded the Clean Water Act. “He said he was going to do it and by golly he did it!” exclaims Roney. The rancher thought the law might limit where his thirsty cows could drink. Blocking regulations that could hurt Roney’s livelihood is exactly why Trump earned his vote. He trusts the President’s business background. Roney was relieved when Trump scrapped the Trans-Pacific Partnership trade agreement in his first week in office. He worried cheaper beef from Mexico would have driven down his profit margins. Roney believes environmental regulations are weaker south of the border, making their beef cheaper. “TPP would’ve killed us!" exclaims Roney. Roney hopes Trump will build on these early moves by rolling back other environmental regulations. But he says some rules do make sense, as long as they don’t apply to him. For example, he supports the mining regulations on a gravel quarry on his property because he wants to prevent damage to the land. And, he's in favor of the rules medical marijuana farmers must follow on the plots bordering his ranch. "Yeah, we need regulations,” says Roney. “They hate me.” He keeps a tight watch on the pot growers. But, he argues, ranchers are different. They don’t need environmental rules to keep them in check. “The reason we survive is that we take care of the land,” says Roney. 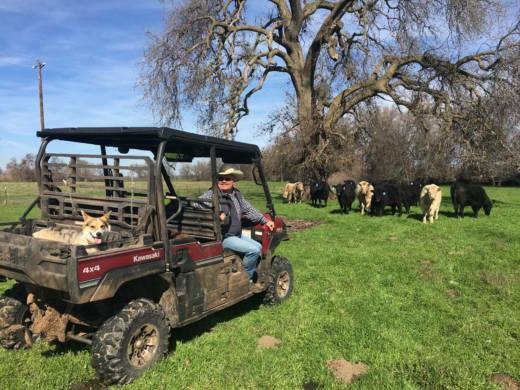 About fifteen minutes down the road another sixth generation rancher named Darrell Wood agrees that taking care of the land is inherent to his business. Wood is also a lifelong conservative who supported Trump from early in the President's campaign. Wood believes in market forces rather than government rules to protect the landscape from things like overgrazing. For example, he points to voluntary conservation programs sponsored by the U.S. Department of Agriculture. They offer ranchers financial bonuses if they care for the land in a sustainable manner. Wood hopes Trump’s administration will listen to ideas from people like him—to create more incentive based policies rather than more regulations. A lot of people I talked to in Tehama County felt similarly: that the environmental conversation hasn’t included their voices. Billie Roney said it best. She’s the wife of rancher Wally Roney. “Is there anybody, anywhere who I feel like-minded with who might be a little less radical?" asks Billie Roney, who feels liberals dominated politics for too long. "I’ve just felt disenfranchised for a long long time." Billie Roney says she empathizes with people who are scared right now by what they’re hearing from Trump. She says she used to feel like that when Democrats talked about tightening gun control, expanding the government's role in health care and legalizing undocumented immigrants. She is especially worried about the recent addition of the wolf to the endangered species list. “We had fears too,” says Billie Roney. “All those visceral fears you’re watching with people, that would be me in the fetal position watching some of the things that happened under the Obama administration," says Roney. Now, Billie Roney says, listening to Trump is a welcome relief after eight years where she felt like her way of life was not only ignored, but despised by the other side. Most everyone I talked to in Tehama County said the only way to bridge the divide in California—and the nation—is for everyone to be at the table.